During the first week of a new season, it’s not very often that the eyes of the baseball world are diverted to the minor leagues. This was no ordinary opening weekend, however. Two of the game’s better pitching prospects in some time were both making their professional debuts, and lighting up radars guns while doing so. 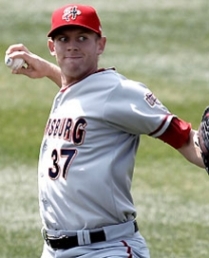 Stephen Strasburg topped out at 99 mph in his pro debut (Photo: Getty). Stephen Strasburg, perhaps the most heralded collegiate pitcher ever, made his first start for the Harrisburg Senators, the National’s Double-A team in the Eastern League. In front of an overflowing crowd at the Altoona Curve’s (Pirates) home ballpark, Strasburg consistently hit the upper-90s, topping out at 99 on three occasions, according to ESPN’s Keith Law (whose scouting reports are a must read). Law also stated that while Strasburg did lack fastball command at times, his curve ball had a “sharp two-plane break and a downward finish”. Even though Strasburg may be ready for the majors now, he does need to fine tune his change-up, so perhaps his stint in the minors will give him the opportunity to do that. Law concludes that 8-10 minor league starts should be more than enough to accomplish the task, which probably makes Nationals’ GM Mike Rizzo smile as that would be more than enough time to keep Strasburg under the team’s control for a seventh season. 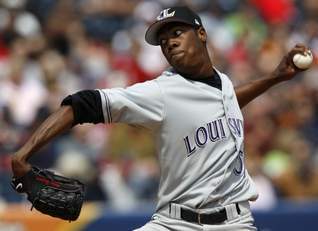 Obviously, both Strasburg and Chapman have enough talent to be effective in the majors right now. So, why are they making minor league debuts? It has become fashionable to blame both decisions on economics. Basically, by keeping Chapman and Strasburg in the minors until at least early May, the Nats and Reds will delay the service time clock enough to ensure that each pitcher remains under their control for another season (players with six or more seasons are eligible for free agency). While an economic basis for Chapman’s and Strasburg’s demotions is compelling, it does seem as if each could use a few minor league starts to fine tune pitches and mechanics. No scouting report has suggested that either is flawless, so in this instance, maybe we can give the Nats and Reds the benefit of the doubt? After all, the Reds had no problem letting Mike Leake, who was drafted 8th overall in the 2009 draft, jump straight from college to majors. Interestingly, Leake also made his professional debut on Sunday by beating the Cubs. I guess it didn’t take long for Leake to pick up on this time honored baseball tradition.